Natalia Makarova is universally acknowledged as one of the greatest ballerinas of our age. The content of this television spectacular was chosen to show off the astonishing range and artistry of this uniquely gifted dancer. 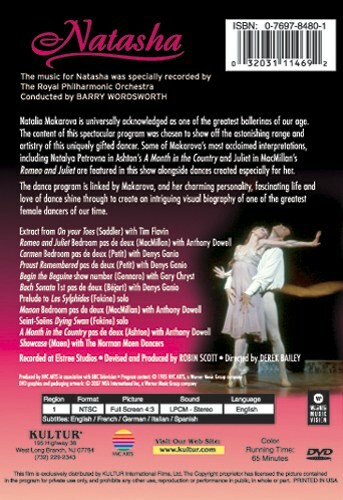 Some of Makarova's most acclaimed interpretations, including Natalya Petrovna in Ashton's, A Month in the Country and Juliet in MacMillan's Romeo and Juliet, are featured in this recording alongside dances created especially for her. The dance program is linked by Makarova, and her charming personality, fascinating life and love of dance shine through to create an intriguing visual biography of one of the greatest female dancers of our time.